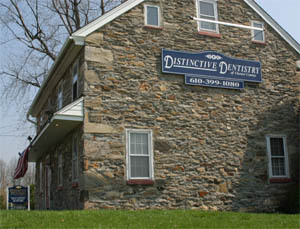 At Distinctive Dentistry of Chester County, we are fully aware of the hectic demands on your time. In light of this, we have structured our office hours to enable you to schedule an appointment at a convenient time. If you have an after hours emergency, please telephone us at (610) 399-1080. If you must re-schedule an appointment, please extend us the courtesy of 48 hours notice, since changes in appointments affect other patients as well as our staff. From Delaware County, PA Locations – Take West Chester Pike/PA-3 West towards West Chester. Make a left onto East Street Road (PA-926). Take East Street Road approximately 5 miles. The office is on the left just before US-202. From Delaware and Southern Locations – Take US-202 North towards West Chester. Turn right onto East Street Rd (PA-926). The office is immediately on the right. From King of Prussia and Western Locations – Take US-202 South towards West Chester. US-202 becomes a ramp, merge onto Wilmington Pike/US-202 South/US-322 East. Turn left onto East Street Road (PA-926). The office is immediately on the right.